Who has been stripping the leaves from our Daisies? 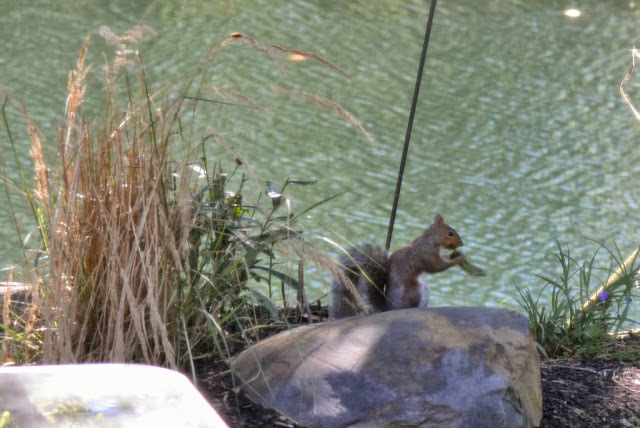 You probably won't believe it, soooooo, here's a photo showing the leaf thief.... and, yes, this is a photo of a squirrel eating a leaf. The squirrel pulls off a leaf and eats it stem first. Nibble, nibble, nibble... in goes the leaf, stem-end first... nibble, nibble, nibble right down to the leaf tip. Seriously, that squirrel is nuts about Daisy leaves. I didn't know they'd eat Daisy leaves. Thought maybe they'd collect them for their nest ... but not eat 'em.